The offices of the practice are situated in a former farmyard off the High Street in Whittlesford. The farmyard consisted of a number of dilapidated buildings including a listed Dutch barn. After detailed discussions with the planning department a scheme was prepared to restore the barn and replace the single storey stables with an office building for the practice. 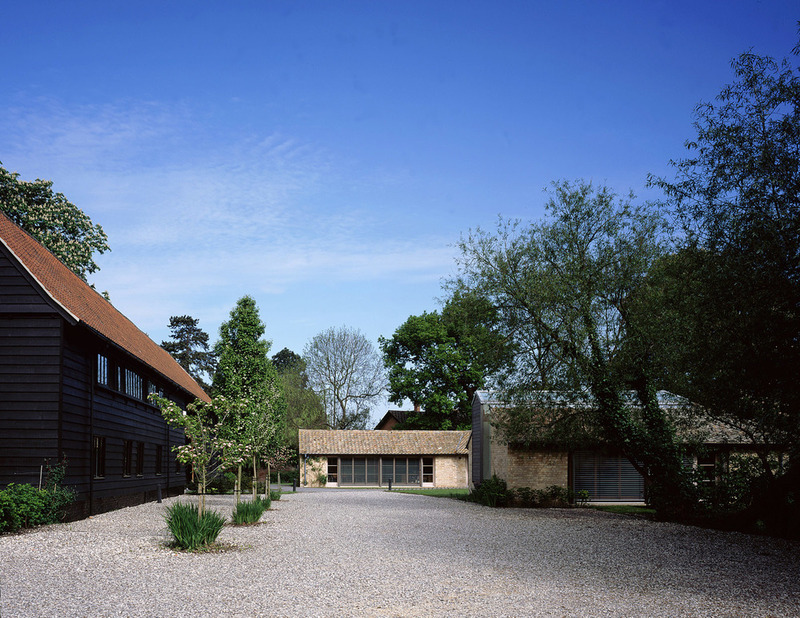 The offices are designed to form three sides of a courtyard facing the listed barn. The accommodation includes an open plan drawing office, meeting rooms, library, reception, printing facilities, kitchen and WCs. Continuous glazed screens face south and east into the courtyard and out to a landscaped pond. The drawing office is partly top lit through a continuous rooflight, providing clear even light to the work surfaces below. The roof structure is formed with laminated timber beams and round section columns, with timber ribs supporting a split roof section below the rooflight. The glazed screens and external timber columns are carefully detailed with large sliding doors. Solar glare is controlled by an electronic louvre system, which can be retracted into concealed housing. A projecting gable window hangs clear of the face brickwork and is clad in timber boarding, alluding to the agricultural origins of the building. An entrance path in granite setts, set out in a continuous curve, joins the main entrances of both buildings and forms the basis of a series of radiating hedges, which give a sculptural form to the space.